Shopping the markets was one of my favorite things to do in Southeast Asia. Luang Prabang has an amazing night market. Chiang Mai has the Sunday night market. Pai has its walking street. Phuket has the weekend market. Well Bangkok, Bangkok has too many markets to count. 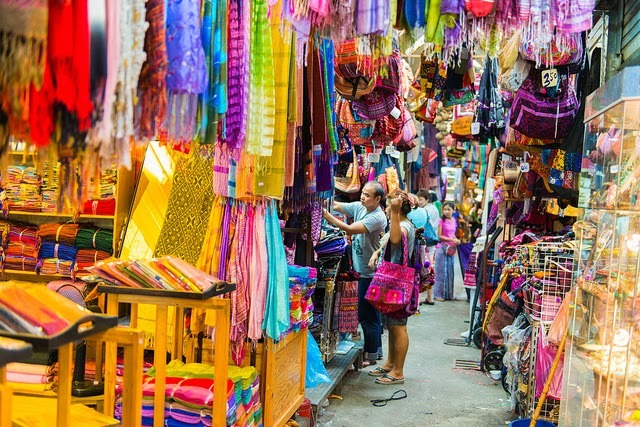 Just like the city, Bangkok’s markets are large, fast-paced and a bit overwhelming. Take some time to walk around the market before you buy anything. This will give you a good idea on the pricing and what is for sale. At one stall, I liked a pair of sunglasses but the price not so much. The man was a bit of a bully and kept yelling after me so I walked away. After a lap around Khao San Road I knew what the other vendor’s were selling similar pairs for and came back prepared with a price. Rather than asking how much, I jumped right in by offering my price. He looked at me silent for a few beats and then said, “I don’t know what to say when you come knowing the price… you look around.” Yes good sir, I looked around. So prepared with the proper knowledge you can stop even the worst hounds from hassling you and get what you want for a fair price. Don’t be afraid to negotiate a price. I was once told that the general rule is to cut a vendors price in half then negotiate up from there. For some coming from cultures that don’t practice haggling, this might feel uncomfortable. You might even be worried about robbing these vendors of a living, but understand that they are experienced businessmen, they expect to haggle and they will not sell you anything that does not earn them a profit. If you are looking to buying anything in multiples or in bulk most vendors will gladly cut a deal. My favorite street vendor, albeit a bit reminiscent of the slimy car salesman type (think Danny Devito in Matilda), once said “never try, never know.” He was in the midst of hounding me to buy a men’s tank that was about 5 sizes too large and I couldn’t help but laugh at the truth in his motto. When you’re shopping the markets, don’t be afraid to slip the clothes on right there in the street to make sure they will fit right. The sizing in Asia is quite different than those of other countries. In the end the tank was too big (as expected) although the vendor insisted it would make a great dress. When a vendor is being too pushy, doesn’t have what you want or refuses to haggle on a price, don’t be afraid to walk away. I promise you will find something similar, if not the same exact item at another stall. This is where the expression “same same but different” was born. The products at the market will begin to repeat as you explore on and the vendors will try to convince you that although they are selling you the same thing it is somehow different. Or they will try to convince you that although they don’t have the exact product you are looking for, they have something so similar it is “same same but different.” Either way, don’t feel bad and say no when you don’t see exactly what you want. When I first arrived in Bangkok, the markets of Khao San Road were so overwhelming I immediately ran for the hills, or in this case booked the first available train ticket out of town to Chiang Mai. The vendors and tuk tuk drivers were yelling at us, “What you want? What you look for? Where you want to go?” and grabbing at our arms. It was way to too much and I had no sense for how much they were asking me to spend. Please refer back to #1 and #4 or maybe get acquainted with the city before you let some pesky vendors chase you away. And when it is time to shop, just enjoy yourself and have fun. You can talk and joke with the vendors as you look without having to buy. Where is your favorite market in Bangkok or even SE Asia? Wondering where to find the markets? Check out this post that includes a few of my favorites in Bangkok. Want to try some delicious street food while you’re shopping? Take a look at this Thai street food guide. And if you are interested in peeking in on another great market town, here is one on the Phuket Weekend Market.